I hate mildew. It grosses me out. Not only in my bathroom, but my kitchen as well. For some reason it likes to form in the grout of my kitchen tiles and of all places, that is the worst possible, ever! I'm preparing food there so mildew is not welcome! 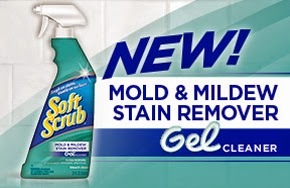 So even before I hit the shower tiles, I put Soft Scrub Mold and Mildew Stain Remover to the test in my kitchen! It worked right away. I was impressed. No waiting, no hard scrubing, it honestly did the work for me. It was actually kind of fun rubbing up the grime and seeing how shiny my kitchen could actually be. Then I tackled the shower. Again, sparkling clean, I would use this product again in a flash! Do you want to give it a go? Enter below to win 2 Bottles of Soft Scrub Gel Cleaner for yourself! Disclaimer: I received a free product for the purpose of this review. All opinions expressed here are my own. Cleaning mildew, and tubs in general. I really don't like cleaning toilets. Cleaning the toilet is the worst! I hate cleaning the bath tub. I hate cleaning the toliet. I hate cleaning the shower!